Summary: SuperCX racing entirely within the Oaktree Area speedway racing track. A tight and technical course run in a heats and finals format. Each rider gets 3 heats of 10 mins and a final of 20 mins. Finalists are determined on the lowest points scored throughout the 3 heats. 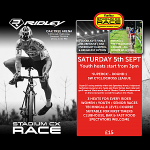 Part of the South West Cyclo-Cross League.